2019-04-04 14:00 (GMT) / DURATION: 45 min. 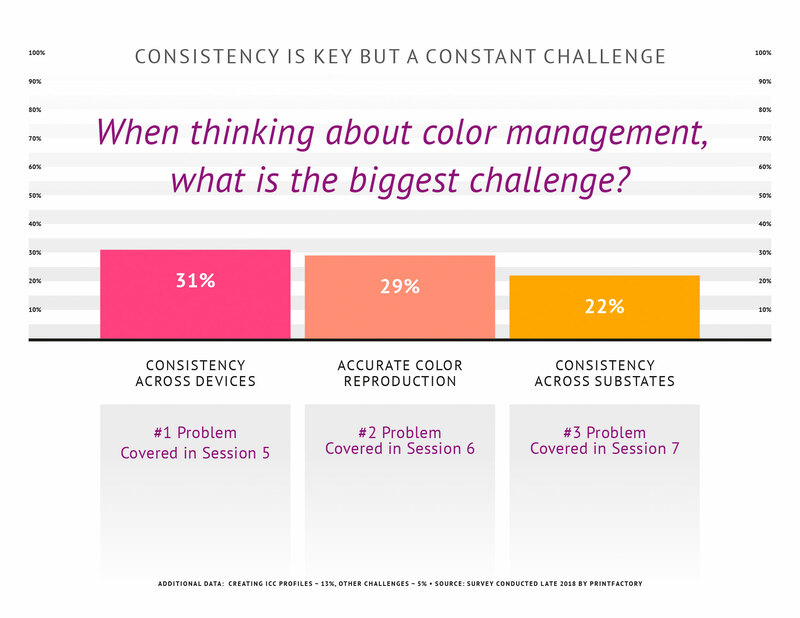 This road map of "how to" seminars, will help your company improve color reproduction capabilities which will eliminate waste, improve quality, and meet customer expectations every time. Without this process, you will continue to point fingers, refund money for reprints, and suffer even lower profitability due to excess waste and frustration. Transition away from a "break/fix" mentality where problems only get addressed when they break, to a "proactive assessment" mentality where you keep your devices operating within expectations and eliminate waste. Not just theory, practical "how to" procedures that you can do for free. We have engineered these seminars to allow you to follow specific steps to understand how your devices print color, and what needs to be done in order to improve the consistency and accuracy of your printing devices in your organization. We will tackle these issues and many more in this series of seminars designed to help you get control of your color. These videos will be recorded so they will be able to viewed at any time to help educate users, managers and customers on the challenges related to quality print manufacturing. Fundamentals to get started, basic terms and definitions to help you understand how to quantify color consistency and accuracy. Terms covered include precision and accuracy, delta E and E-Factor, and color match versus shared color appearance, process control and color conformance. Printer Consistency- If your printer isn’t precise, how can you set quality expectations? This seminar will cover how to determine the precision of your printers. This technique can be applied to any print technology and is the first step to quantifying the color manufacturing capabilities of your print devices. Print Consistency Benchmarks- Buying a Printer? Things you should know and assess before signing. We will reviewing 20 different digital presses, and 10 large format devices related to the normal variation of specific makes and models of printers. Want to print your own Benchmark Targets? We will guide you through the process and provide files to do it yourself (DIY), files built to work with ISIS, i1 IO, and Exact or SpectroDens. Controlling consistency across substrates- Do you need a profile/G7 Curve for every substrate you print with? What is the variation of your substrate and how does it affect your print variation, and how different are your substrates? Quantifying consistency across devices- How similar do different printers print the same color? Different print technologies, different RIPs, different substrates and different color gamuts, how to bring together. Hint- the more accurate each device is to Print Reference, the more consistent they will be between them. A. How Mature is your Color Control of printing devices? Follow our road map to color maturity and color conformance which will reduce waste and increase profitability Transition away from a "break/fix" mentality where problems only get addressed when they break, to a "proactive assessment" mentality where you keep your devices operating within expectations and eliminate having to reprint, and make good on prints that don't meet customers expectations. 1. Fundamentals to get started, basic terms and definitions to help you understand how to quantify color consistency and accuracy.